As the largest aviation maintenance group in North America, Delta TechOps provides full-service maintenance to more than 850 Delta aircraft and their engines as well as maintenance services to more than 150 other operators, cargo operators and the military and government, through the airline’s Maintenance, Repair and Overhaul business. The division is comprised of more than 10,000 technicians, engineers and support staff who are focused on providing top-notch, reliable service and eliminating maintenance cancels. Delta’s focus on using technology to predict when maintenance should be performed has increased in the past few years. Recently, the airline announced its investment to use the Skywise open-data platform related predictive maintenance services. As the first major U.S. carrier to invest in the tool, Delta will utilize Skywise on its A320 and A330 aircraft to track and analyze operations and performance data so it can assess the failure probabilities of aircraft parts to anticipate maintenance tasks before they’re needed. In 2015, Delta TechOps began working with Airbus on developing the manufacturer’s initial predictive program, Prognostic Risk Management, by co-designing, testing and making improvement recommendations about some of its key features. With a success rate of over 95 percent, Delta’s predictive maintenance program is just another way it’s building the world’s most reliable airline and providing a new standard of reliability to customers. 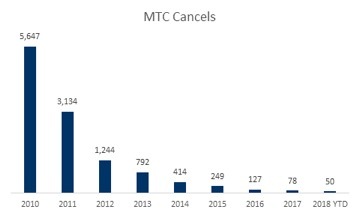 And the proof is in the numbers – between 2013 and 2017 Delta TechOps jumped from 169 cancel-free days to 324. Keeping safety at the forefront, employees focus on three core areas to maximize efficiency including fleet reliability, extended service visits and overnight priority. Implementing these strategies, Delta TechOps has reduced maintenance cancels by over 99 percent per year since 2010. Combining strategies and predictive technology, TechOps provides consistent reliability to support its customers. When engineers and technicians begin their careers at Delta, they participate in a two-week indoctrination to understand the principles of TechOps, perfect basic troubleshooting skills, as well as learn the culture of Delta. Throughout the course of their first year, training includes a mentorship process with a more experienced technician to advance the skill sets required to be an effective team member. As new aircraft are delivered and enhancements are made, engineers and technicians revisit the training process to maintain high reliability with the new advancements. As part of its commitment to educate future aviation professionals, Delta has partnerships with more than 47 maintenance training programs across the U.S. to help identify, mentor and source the next generation of aircraft maintenance technicians. Through the partnerships, Delta offers tours, job shadows and career guidance for the schools as well as training opportunities for instructors. Where possible, Delta also donates serviceable parts, engines and airframes to give students even more real-world maintenance experience working with jet aircraft components. These partnerships complement the airline's recruiting structure of working with the U.S. military and regional airlines.